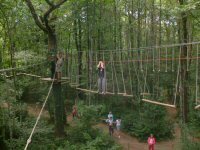 For those who want an alternative to lying on a beach, visiting the many attractions or walking through the Vendee's varied landscapes then an adrenaline filled Adventure park may well fit the bill. 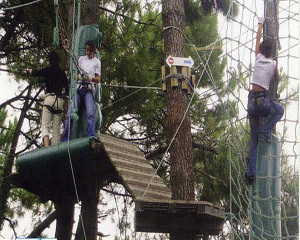 The following adventure parks could be just what you are looking for. Le Grand Defi. 40 rue de l'Etoile, St.Julien-des-Landes. Adventure in the trees, with 5 courses for all the family. One of the courses has Mega zip lines above the water. Open June to Early November. Paintball on the same site. For those who want fun, excitement, exercise and an adrenaline rush then paintball fighting may be just what your looking for and here in the Vendee there are centres where you can indulge yourselves. Château d'Olonne. Paintball Loirsir Circuit du Puit d'enfer Rue des marchais. Open: July/August everyday 10h to 20h. 3 ha and 5 courses. Open: from April to Sept.
Paintball85, Ave de Baisse, les Salines, Tel. 02 51 59 35 01. Moutier-les-Mauxfaits Indian Forest. Le Bois Lambert, le Bernard, Tel. 02 51 34 35 99. Mouilleron-en-pareds. Domaine St.Sauveur. Tel o2 51 87 56 78. Open: every day July/August, weekends May-June and September. Quad / paintballs / buggy track or radonnées in the marsh.